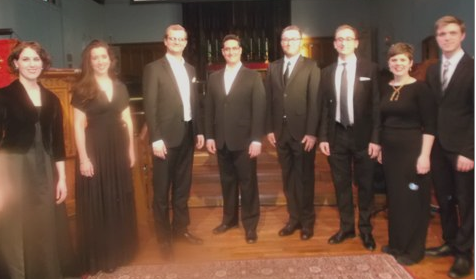 Hammer Baroque presented a concert of 16th century masterpieces from northern Europe called Tous Les Regretz, featuring the superb singers, Opus 8, on March 19th, 2016. The sizeable audience loved the polyphonic, contrapuntal music of the long ago sung acapella by the eight accomplished musicians who obviously enjoyed themselves and had great respect for and love of the music. Opus 8 features sopranos Jana Miller & Clara MacCallum Fraser; Rebecca Claborn and Simon Honeyman, altos; with tenors Peter Mowat, & Robert Busiakiewicz plus David Roth, baritone; and Sean Nix, bass. They are all wonderful singers. The opening song, Mon Petit Coeur by Flemish Cipriano de Rore, had the audience awash in gorgeous sound and this was followed by a madrigal by the same composer, who had himself been a singer at St Mark’s in Venice, and knew how to present voices to advantage. Having the words of the songs on the screen in English helped enhance the enjoyment of the music. Two very different songs by Jacques Clement (non Papa) came next. The first was a lively tale of Jaquin who needed to have fun, and then a timely lament for Babylon and Syria ‘Woe unto you Babylon and Syria, weep for your children.’ which was both beautiful and powerful and fostered reflection on the current situation of woe. The ensuing Laudate Dominum had the presenter apologizing for all the ‘Hallelujah’s in the week before Easter. It was a joyous celebration of the Resurrection. Then—the title piece of the concert ‘Tous Les Regretz’ by Nicolas Gombert. Gombert had been master of the boys’ choir for Emperor Charles V until he was convicted of sexual crimes against one of the boys and sentenced to hard labour on the galleys—hence the regret. The music is very beautiful and thoroughly filled the church with longing and sadness. Gombert was pardoned after seven years simply because he could write such stunning music. The final piece before intermission was another of his, ‘Je Prens Congie’ which contained the line ‘I bid farewell to my loves who promptly see me die’ and it was a mournful goodbye with sound that swelled and ebbed and finally faded out. The second half of the program was given over entirely to William Byrd (1539-1623), another very interesting composer who lived during the religious turmoil fostered by Henry VIIIs children and yet stuck tenaciously to his Catholicism especially as he aged. The motets began with the advent ‘Vigilate’, keep watch for the Lord. This was a composition of a confident composer who knew his subject thoroughly. His very famous and gorgeous ‘Ave Verum Corpus’ came next— ‘we are all your people’, perhaps a plea for religious tolerance? The prayer ‘Ne Irascaris Domine/Civitas Sancti Tui’ was a sad and wistful elegy for Jerusalem followed by the loud and exultant ‘Laudibus in Sanctis’ which asked the audience to ‘praise God with music and dance’ and had the singers doing their best to sound like blaring trumpets. The afternoon wrapped up with an ‘Agnus Dei’ from a Mass for Five Voices asking twice for mercy and finally for peace, which the music gave in abundance. Hammer Baroque’s next concert is on April 9th; 4pm at The Rock on Locke.